How do we combat the things in our lives that try to pull us away from God? 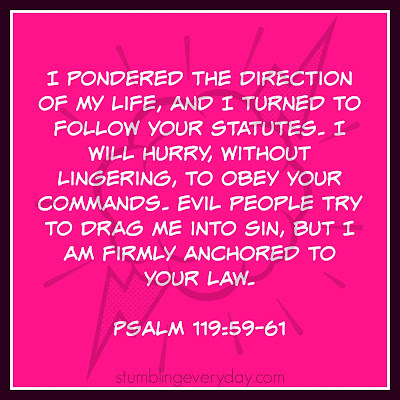 Do we hurry without lingering to obey God’s commands instead of allowing ourselves to be swept away by the world? It’s so easy to go with the flow. Until the flow turns into a waterfall. A whirlpool. A steep drop-off. Sometimes, the flow ends abruptly and we end up sitting in the middle of a desert. In each of these scenarios, we are at the mercy of whatever swept us away. Who knows what the end point will be? Satan attacks God’s strongest warriors, I’ve learned. Those who have strong faith are constantly under spiritual attack from the devil’s schemes. An army of heaven’s soldiers is always fighting for our souls. It’s an abstract thought for a very real world. The whole business wears me out. I don’t have the strength to stand on my own. I rely on God’s army to back me up, but sometimes, I’m too overwhelmed to fight or to hurry to obey God’s commands. Evil comes too fast, and I always seem to have one hand tied behind my back. So I sit down and wait for the danger to pass. The thing is: the danger doesn’t pass. It is always there, inching its way closer until it takes control. We all have areas of weakness where the enemy takes aim. Physical or mental health, relationships, personal tendencies – we all have soft spots. Sometimes they change or multiply. None of us is fully shielded from danger all the time. I have to assume that not one person on this earth is immune to the strength of Satan’s attacks. None of us is God, after all. Even Jesus was tempted to stray from God. The stronger we are in faith, the more underhanded are the techniques used to fight against us. Satan can even use our own perceived strengths to make us blind and arrogant. We don’t even know that we are being overtaken. “Put on all of God’s armor so that you will be able to stand firm against all strategies of the devil,” says the Bible (Eph. 6:11). God’s armor: his word, Jesus’ blood, the Holy Spirit, our faith. 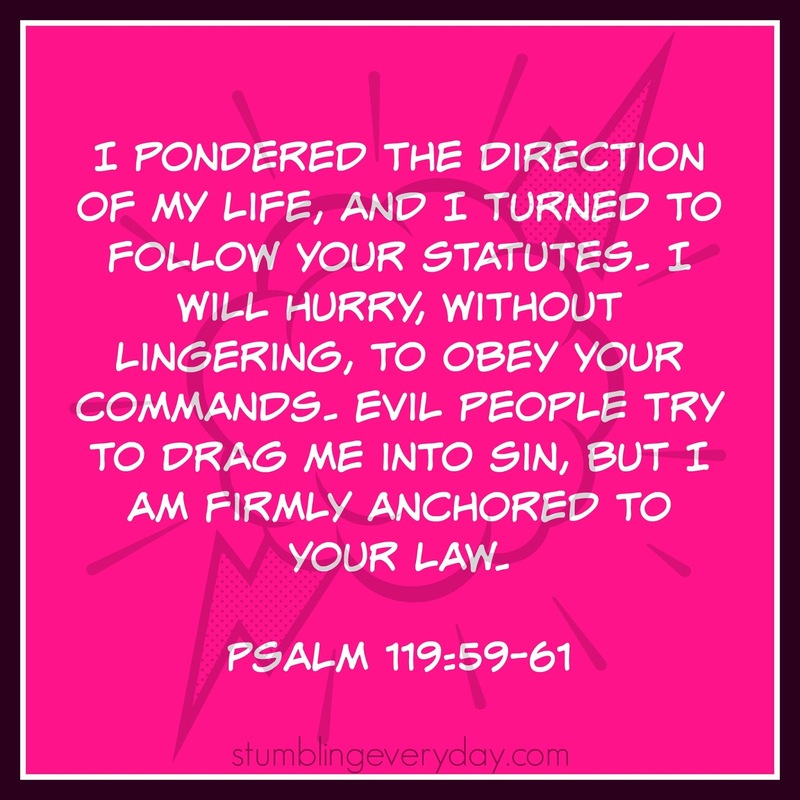 At times I find myself – like the psalmist – pondering the direction of my life. Am I going in the way that leads to the Lord? Or have I become tired and complacent, allowing the world to sweep me away? Worse – am I relying too much on my own strength to carry me through the battle, becoming blind to my own weaknesses? Only when I am fully anchored to God can I live a holy life. From the smallest seed of faith, I have learned that I can do nothing on my own accord to live the life God intends for me. My weaknesses are too great – I am only one soldier fighting against Satan’s army of evil. But with God’s word, Jesus’ salvation, and the Holy Spirit, I can be victorious, refreshed and ready to fight without lingering. "Only when I am fully anchored to God can I live a holy life." I love that. And "...I can do nothing on my own accord to live the life God intends for me." You took the words right out of my mouth! This was a very encouraging read! Love this. The same scripture we talked about at Church on Sunday! It's the theme for the week. Something my dad always told us as kids and we thought it was so weird- He would tell us before going off to school to get our armor on. And he would pretent to put our helmets, belts swords on us. As a grown woman now it's so true. We have to be prepared to go out in the battlefield every day. Something I will be sharing with my kids as well. It's funny that I am reading this now. I was on vacation last week and skipped my morning routine and oh boy, was I under attack! If we're not in the word and connected, it's such easy game for the enemy to get us to give in to the flesh. It's a slippery slope for sure. I'm not always so great about daily Bible study and prayer, and I can feel it acutely when my guard is down. God is sufficient! Only being a branch on the vine will we bear fruit. I love to think about ignoring the devil and he will flee!! Blessings today from Christian Women Bloggers Unite. All so true what you write, how easy it is to get sucked up into the world, but how God saves us! Blessings! "God is sufficient" - a whole other blog post in three simple words.